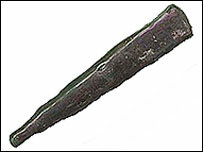 The 4th Century AD tool, which may have been used as a nail, was probably made using the process of furnace smelting. The discovery, which occurred at the site of Heeten, is reported in the Journal of Archaeological Science by Matthijs van Nie and Evelyne Godfrey. "We think it is the earliest ultra-high carbon steel from Europe," Godfrey, of the University of Bradford, UK, told BBC News Online. "The punch was broken in use and then it was lost. But it was a finished, functional tool. It was no accident." The very first iron production may have occurred by chance, perhaps with iron ore rocks in a camp fire. At some stage, humans learnt how to improve the quality of this basic metal product by raising temperatures, reducing impurities and controlling the content of carbon - to make the resilient alloy known as steel (which generally has a carbon content of less than 2%). The origins of ultra-high carbon steel production are traditionally thought to lie in Asia. In India, the production of a type of cast iron known as crucible steel can be traced to the 3rd Century BC. And Romans were demonstrating knowledge of cast iron manufacture by the 5th or 6th Centuries AD. But the 4th Century AD steel punch is evidence of an indigenous steel-making tradition in northern Europe, the authors argue. The authors suggest that the steel punch from Heeten was not made using iron casting, but with the traditional bloomery furnace smelting process used throughout Iron Age Europe. This involved tapping molten slag out of the side of the bloomery furnace. In the furnace, an iron "bloom" would form, which would then be removed. "There is thus far no evidence for crucibles or cast iron processing remains of the Roman Iron Age in northern Europe that might indicate Germanic manufacturing of ultra-high carbon steel by decarburisation from cast iron," Evelyne Godfrey and Dutch archaeologist Matthijs van Nie write in their journal paper. The punch's 2% carbon content is at the limit of what can be produced using the furnace smelting process. But archaeometallurgist Dr Chris Salter, of University of Oxford, told BBC News Online the find was nothing unusual. Dr Salter said he had recovered an example of a 2nd Century steel object from Carmarthen in Wales. He added that ultra-high carbon objects are often not identified as such when they are found, partly because they are more subject to corrosion than unalloyed iron ones. During the 4th Century AD, Heeten was occupied by a Germanic-speaking tribe known as the Salian Franks. The Frankish tribes of modern Europe would later give their name to the country of France.